Commemorating the Beginning of an Era that ROCKED the World! Epiphone is proud to introduce the Ltd Ed "1960" Les Paul Standard honoring 50 years of perhaps the most beloved electric guitar of modern times. The Epiphone 1960 Les Paul Standard comes in three distinct colors, Heritage Sunburst (Version 1), Cherry Sunburst (Version 3) and Heritage Darkburst (Version 3). The 1960 Les Paul initially carried over the same basic specifications as its predecessor from 1959. Among these details were the full, rounded "D" shaped neck profile, top-hat control knobs, and Heritage Sunburst finish. These characteristics can be found in Epiphone's new "Version-1" of the 50th Anniversary 1960 Les Paul Standard. However, by the latter part of 1960, several key specifications were changed. The most significant change was the new SlimTaper™ “D” neck profile that was slimmer and considered "more modern" than the fatter 1959 profile. The "new" SlimTaper neck profile went on to become the standard neck on Les Pauls throughout the 1960s and can be found on Epiphone's "Version-3" of 50th Anniversary 1960 Les Paul in both Cherry Sunburst and Heritage Darkburst. Both versions were equipped with flatter, wider frets that allow for more dramatic bends. The impact of that change was not truly realized until the 1960's when rock and blues players like Fleetwood Mac’s Peter Green, Michael Bloomfield, Duane Allman, and Eric Clapton discovered the magical voice and feel of the Les Paul Standard. And since our history with Les Paul goes back to the 1940's when Les would work late hours at the Epiphone factory in New York to perfect "The Log", the first solid body electric guitar, we made sure our Limited Edition pays homage to the man that started it all. Each guitar includes a numbered certificate of authenticity as well as Epiphone's Limited Lifetime Warranty and 24/7/365 Customer Service. If you don't have the wallet for a real "1960" or want a professional instrument that you can perform with night after night hurry and pick up an Epiphone 1960 Les Paul Standard today. Quantities of the "1960" (both Version-1 and Version-3 combined) are limited to 1,960 total worldwide. True to its heritage, the Version-1 features an authentic 1950's rounded neck profile. Often referred to as "the baseball bat," this neck feels beefy yet comfortable in your hands while adding warmth and sustain with its greater mass. 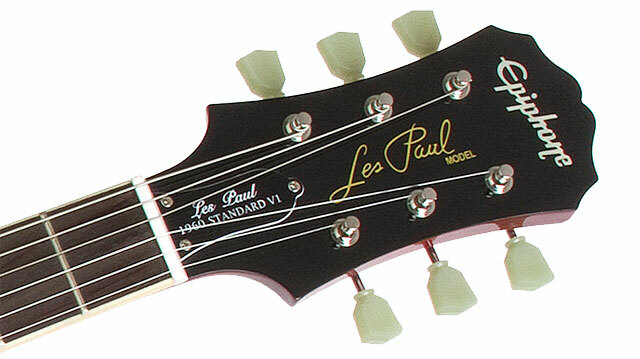 The Version-3 1960 Les Paul Standard features an authentic SlimTaper™ “D” neck profile. Often considered the standard for a slim, fast, yet comfortable neck, the SlimTaper™ helped define a new generation of blues players who were stretching the limits of blues and rock with incredible volume and sustain Les Paul only dreamed about. Epiphone hand fits the solid mahogany neck into the body with an historically accurate "deep-set" long neck tenon that extends well into the neck pickup cavity creating even more tone and sustain. Just like vintage Les Paul Standards, the Epiphone 1960 Les Paul Standard is solid mahogany on the back of the body while the top is a carved Hard maple cap. A premium AAA grade flame maple veneer is attached for that vintage-true "beauty of the burst" look. Capturing everything these tone woods and premium construction have to offer are a pair of Gibson U.S.A. BurstBucker™ pickups. BurstBucker™ pickups replicate the sound of Gibson's original "Patent Applied For" pickups, the same pickups that gave the '59 and '60 Les Paul Standards their legendary sound. Original PAF pickups, which featured unpolished magnets and non-potted coils, had variations in pickup output and tone which came from inconsistencies in winding the bobbins, a result of the lack of automatic shutoffs on the Kalamazoo factory’s winding machines in the late 1950s. Seth Lover, who invented the humbucker, recalled that when humbuckers were first manufactured, Kalamazoo factory workers would wind the bobbins "until they were full." When two coils in a pickup have a different number of turns, that variation puts a little "edge" or "bite" on the classic humbucker sound. That's the sound BurstBuckers™ replicate. 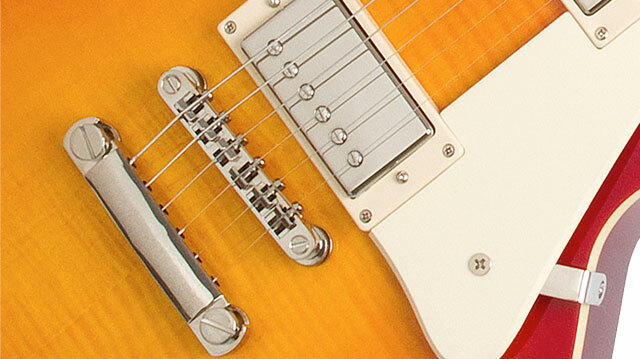 The neck pickup is a Burstbucker™-1 and is slightly under-wound for a "medium" vintage output. The bridge pickup is a Burstbucker™-2 that is wound in the range of a '57 Classic pickup with slightly hotter vintage output. One listen and you'll think you have a 50-year old guitar in your hands! Other unique features in our "1960" Les Paul Standards include Switchcraft™ brand toggle switch, Mallory-150 tone capacitors, gold "top hat" knobs (Version 1) and "metal insert" knobs (Version 3) with metal pointers, nickel hardware and a "stamped" serial number on the back of the headstock. To top it all off, all Epiphone 1960 Les Paul Standards include a replica Lifton-style case with brown exterior and pink interior. Very cool! Epiphone's Les Paul Standard has been the working man’s standard guitar for over a decade. Starting with the same successful recipe as the original, Epiphone significantly stepped things up on the Limited Edition "1960" Les Paul Standard.